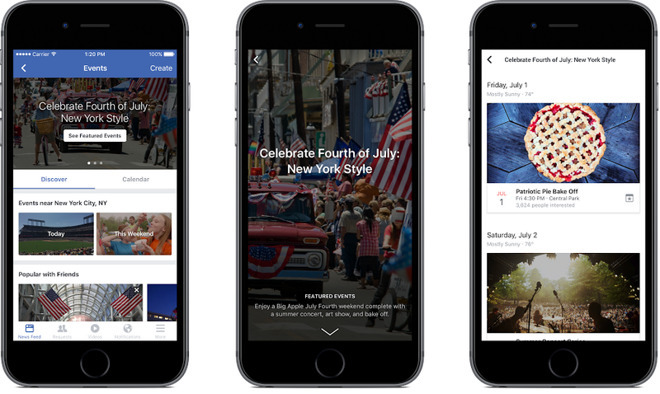 On Monday a newly-formed team at Facebook began curating lists of "featured" events, in a bid to provide better recommendations for people looking for activities around town. For the moment, featured events are only visible to people in 10 major U.S. cities, according to Re/code. These include: Boston, Chicago, Dallas, Houston, Los Angeles, Miami, New York City, San Francisco, Seattle, and Washington, D.C.
Facebook is promising not to give special treatment to advertisers, and claims it will also avoid events "primarily focused on politics or worship." The company notably ran into trouble in May when it was discovered that "Trending" news selections were being deliberately skewed away from conservative topics. For the time being, most Facebook users will still see only "suggested" events, based on various algorithms. The new content is one of many tactics Facebook has employed to keep users engaged with its apps and website. These include things like live video streaming, Instant Articles, and Music Stories that let people listen to tracks without switching apps.